Anton Agius – Prolific sculptor Anton Agius passed away peacefully on Sunday 19th October 2008 aged 74. This write-up is. Anton Agius – Prolific sculptor Anton Agius passed away peacefully on Sunday 19th October 2008 aged 74. This write-up is dedicated in recognition of all the artistic work that Anton Agius created during his artistic career. To his wife Mary Louise for all the support she has given the artist during the past years. To his son Christopher may God bless him and to his other son Anton. Anton Agius was born at Rabat, Malta on the 1st December 1933. He recalls his artistic skills from a young age when as child, he was always eager to play a musical instrument. Anton also recalls a particular moment in his childhood when he was fascinated with the sea its reflections and colour patterns. His mother always encouraged him in his drawing and in his artistic talents. She sent Anton Agius to some drawing lessons under the guidance of his cousin – Sammuel Bugeja, a very good sculptor. Later he started an apprenticeship under the decorator and sculptor, Joseph Galea. During his apprenticeship, Anton learned about the use of stucco, casting, colour mixing and the use of other media. Anton started studying art at the Malta Society of Arts, Manufacture and Commerce, under the tutorship of Ignatius Cefai. He also furthered his study under George Borg, Vincent Apap and Emvin Cremona. Anton respects George Borg recognizes him as being a Master of sculpture at the school of arts of the time. George Borg taught Agius the discipline in the sketching, design and respect to the modeling. At the age of twenty four, Anton won a scholarship lasting for four years given by the Malta Government after winning a competitive exam which was set by the Malta school of arts. He went to Rome studying at the Accademia di Belle Arti and at Scuola del Nudo. He later attended the Scuola delle Arti Ornamentali. He also studied at the Accademia Nazzionali via Marguta under Profs Pazzini. He furthered his studies at the St Martins College and was awarded the National Diploma in Design, Modeling, and sculpture in 1961. During his study at the St Martins, Agius remembers the revolt against the figurative. It was the most revolutionary event in post-war British art. At St. Martins, art became a concept of innovation. Creativity was removed from Anton’s world. Thousand of years of classical traditional art based on reproduction of the human form have been challenged and modified. Anton refers to this event as an evolution event and not a revolution. Anton came back to Malta in 1961 and he was determined to find the original approach to the artistic truth. He used to visit places like Gnejna to examine rock formation, look for fossils, analyze the shape of vines and olive trees. In 1968, Anton exhibited a number of works. His art was fast developing into pure abstract. His creativity was always looking solely for forms. Later, Anton changed his style as he felt that abstract art was not passing his message to the viewers. He wanted his work to carry a message beyond his life, a message that is easy to understand. Anton worked as an emergency teacher in a primary and secondary school. For 10 years he taught sculpture part time at the Malta school of arts. After the school of arts he used to go straight to his studio to continue working on several sculptures either by commission or for his collection. Anton has been commissioned several historical monuments around Malta such as the 6th June memorial, Republic Monument and others. Anton is married to Mary Louise and he is a father of 3 sons. He lost two sons and he is left with one named Anton. When he met Mary Louise, he showed her his dedication and respect to art. She accepted Anton and decided to support him in every moment of his life. Anton’s ambition and dream is to create a cave full of figures of different gender in different positions doing different activities. Anton feels due to his age and his health condition he could not make his dream come true. One of his favorite interpretation subjects is the Crucifixes. Anyone who knows Anton closely could notice a person with success in his artistic journey with a contrast of a life full of disappointments. As mentioned before Anton lost two of his sons one of them few months ago which he is still feeling sad about. Anton describes Christopher as an intelligent person. “He was everything for me. I was so happy when he was born. I did everything for him. I helped him all the way through. It was a big shock for me when I lost him. I am trying to accept but I can never forget.” Anton expresses his suffering in his life with the crucifixes sculptured in olive trees unrefined and in different positions. Another monument that he mentioned is the well known 6th June memorial. Agius can be recognized quite easily from his facial features as one of the central three – an identification of protest moving in different directions against different forces; a protest against the injustice of life itself and against the injustice of God himself. 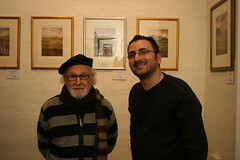 Anton’s work can be found in several towns and villages around Malta. Some of his work is in permanent exhibition in several galleries such as, thirteen olive wood sculptures at the Mdina Cathedral Museum. He also mentioned the statue of peace in Wales, Cardiff. Anton mentions the statue of Malta which was given by Dom Mintoff to Gadafi. Anton Agius has been honored with several prizes and awards for his artistic achievement, including a 1st Prize in Human Rights Art Exhibition held in 1968 at the Malta National Museum, the Onoroficenza Per Meriti by the Associazione Culturale Amici di Pan of Florence in 1979, the Artist of the Year award in 1980 and in 1982 Targa d’Oro by the Associazione Nazionale Artistica Culturale of Italy. In 1999 he was awarded 1st Prize in the International Art Biennale of Malta In 2006 he was awarded a Gold Medal in recognition for his achievements and interest in the Arts by the Malta Society of Arts. Anton mentions that he has been ordered as a chev in the order of St. John. This article will be published on the website www.artinamtla.com along with photos of selective work of Anton Agius.